ProGreen’s Playground Extreme artificial turf is the perfect synthetic turf for your family play area. Even though synthetic turf installations for playgrounds require one extra component that is not necessary for our other turf products – we choose not to use crumb rubber as an infill, rather a foam pad that is placed beneath the turf to provide added safety. These foam pads are available in one to two inches thick; the size needed is entirely dependent on the height of your play structures. Your Child’s Safety is important to us – we know that children will at some point time fall in their play area. That is why we provide a highly elastic more comfortable surface for falls, and they are completely free of rubber, lead and any other typical infill heavy materials. Plus, they are non-microbial and resistant to bacterial and fungal growth. 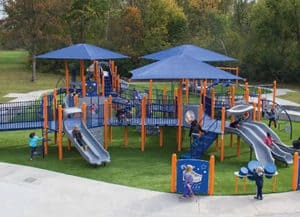 Strong and Durable – Playground Extreme Synthetic Grass is made to retain their shock absorption ratings for many, many years. Superior artificial grass drainage – the pad’s that we use drainage is so effective that your children can be outside playing within 15 minutes after a rainfall. This is a big reason that families choose our artificial playground turf versus natural grass. Artificial Grass for the Indoors too – we can still install the foam pads underneath the artificial grass, which is a great option because kids also fall inside. Indoor or outdoor it still has the anti-microbial and anti-fungal properties, this is important because we know that kids spill things indoors as well. It’s easier to install – by using the foam pads instead of a crushed stone base (depending on your local soil conditions), it speeds up the installation process and saves you money. Stays green and beautiful all year round! In addition to the safety features, Progreen’s artificial grass is low maintenance and will retain its beautiful green color all-year-round. 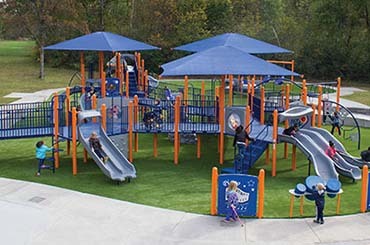 It truly is the perfect material for use in home playgrounds and child care facilities. For more information about our synthetic grass for playgrounds, please do not hesitate to contact us.